As of Spring 2017, most of the courses in this degree program are offered at the UH Sugar Land campus. The Biotechnology degree program provides students with strong core science concepts and an application-oriented undergraduate education. Strongly interdisciplinary, this innovative program includes faculty and courses from the College of Technology and the College of Natural Sciences and Mathematics. Our objective is to prepare students for employment opportunities in the critically important and dynamic biotechnology industry. In addition, students gain the knowledge and core set of skills that span across basic sciences, technology, engineering, and mathematics (STEM) education. With an emphasis on environmental biotechnology, this is the first program in the State of Texas to integrate bioprocessing, nanobiotechnology, bioinformatics and environmental biotechnology into an undergraduate curriculum. Develops adaptable students with a strong foundation in skills that are relevant to the changing world of biotechnology. Provides students with practical training in the skills and techniques of biotechnology. Integrates the laboratory and lecture components of the program through the use of an experimental approach to learning. 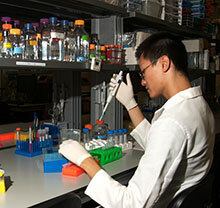 Uniquely combines practical, hands-on biotechnology training with cutting-edge biotechnology research and teaching. The curriculum tracks: 1) Bioprocessing, and 2) Bioinformatics give students the flexibility to tailor their degree based on their interest, educational background and career goals. Combined with core courses our students benefit from broad exposure to biotechnology. The presence of the Texas Medical Center and a growing biotechnology and pharmaceutical industry in the greater Houston area, position our program at the forefront of biotechnology education. Be part of one of the fastest growing industries. Make long lasting industry connections. Get involved in the latest cutting edge technology. then please contact our academic advisors for more information. Biotechnology is technology based on biology. It combines biological disciplines like genetics, molecular biology, biochemistry, embryology and cell biology with technical disciplines like chemical engineering, information technology, and robotics. As information technology drove economic progress in the latter part of the 20th Century, there are expectations that biotechnology will be a significant factor for progress in the early part of the 21st century. Organizations are using biotechnology in drug development, medical treatments, agriculture and food processing, biosecurity and biofuels, with new techniques and applications for biotechnology continuously being discovered. In agriculture and medicine, biotechnology techniques have produced new and improved foods, virus resistant crop plants and animals, advances in insect resistance, new antibiotics, vaccines for malaria, improved ways of producing insulin, diagnostic tests for hereditary cancers and Huntington's disease and treatments for AIDS. Increasingly, biotechnology is also being applied to problems in the environment and in energy. Genetically engineered micro-organisms and plants clean up toxic wastes from industrial production and oil spills. Genetic methods are used to identify particular populations of endangered species. Minute traces of animal or plant remains are used to track and convict poachers. Genetic analysis helps botanical gardens, zoos, and game farms improve their breeding programs by determining the genetic diversity of various plant and animal populations. Microbes are making it economically feasible to produce ethanol for running machinery from corn stover, wheat straw, sugar cane waste and other agricultural crop residues. The Society for Biological Engineering at UH is the newest student organization on campus that caters to young professionals aspiring to enter the field of biological engineering. We devote our efforts to integrating our members with industries that can benefit from the knowledge and skill-set of an engineer, technologist, and biologist combined. Though our roots run with biotechnology, we welcome students of other disciplines.